Earlier this week I was putting away some fabric and noticed a stack of Out to Sea that has been sitting in my stash for a while. After I made this quilt, I fell in love with the collection and bought a whole bunch of it. Of course I liked it so much that I didn't do anything with it until this week. I used the baby size of The Betty Quilt pattern. When I wrote the pattern I made the twin size version and have been wanting to make the other two sizes, and I had just enough time to squeeze in the baby quilt this week. The backing is the dark pink anchors and the binding is my favorite print from the collection. And I made sure to get a few mermaids into the quilt. I used Quilter's Dream Puff batting for the first time and I really love the texture it gives the finished quilt. It is fluffy, but still feels substantial without being bulky. Finished size: 42" x 51"
Since my scrap bins overfloweth, I have decided to start giving away my scraps after I finish most projects. I have a nice sized stack of scraps leftover from this quilt that I would love to giveaway. If you are interested, just leave a comment and I will pick a winner in the next few days. A winner has been chosen, congrats Kirsten! I will be giving away more scraps in the future so watch out for future posts. The mermaids are just too cute. My granddaughter is, at the moment, obsessed with mermaids the leftovers would make a cute pillow or bunting for her bedroom. Thanks for the opportunity to win. Ooooh! Pretty, pretty scraps! Thanks for the giveaway. I would love your scraps! Oh yeesss please! Love this collection! This is a lovely pattern and I would love to give the scraps a good home. Yes please, I love your Betty quilt pattern! Cute quilt, I love how the big strips overlap! Thanx for the chance to win some lovely leftovers! Love this quilt!!! My daughter loves mermaids!!! Love this quilt! Thank you for the scrap giveaway! Oh, I love scraps! So much fun to play with! Lovely quilt. I would love to have the scraps. Thanks. Your quilt is gorgeous! 💖 And Out to Sea fabric is beautiful...I would love to have the sraps! Love the quilt! The fabric is awesome! Thanks! This is one of my favorite patterns and my Gram that passed away this year was named Betty. She didn't quilt as she couldn't understand why people"cut up fabric just to see it back together!" Hee hee. adorable! I'm in a baby quilt making phase myself. 2 due and making 2 extra as backkup! I want to make a quilt with this Betty Quilt Pattern. Where can I find it and those fabrics? Beautiful! So pretty - I would love to use this fabric to make something for my niece!! thank you - your quilting is lovely! Love scraps! And your quilt is very pretty! Your quilt is just adorable! This is a fantastic pattern to showcase some sweet prints! What a gorgeous quilt!! I didn't see when this line came out, and would love to play with your scraps. Thanks for the chance! Beautiful quilts produce beautiful scraps! Your scraps would love to play with mine and make something lovely! I like your idea of finding a new home for them. Thanks for the chance to win these scraps! I'd love a chance to win your scraps! Such a pretty quilt! Mmmm love the quilt and would love the scraps! Thanks for the chance! Love this quilt! Would love to have some scraps! Very cute quilt. I would love to have your scraps. Thanks for the opportunity. 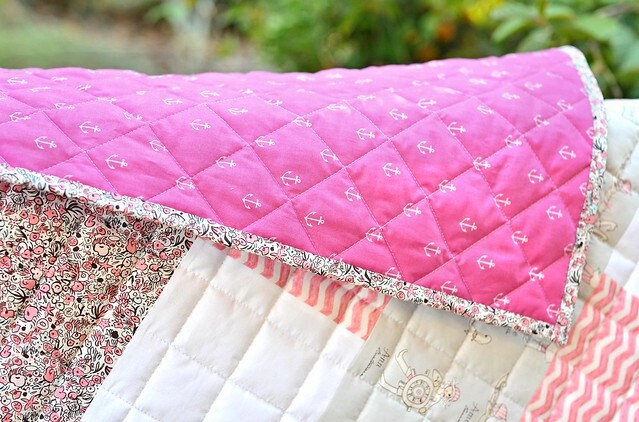 Sweet pink quilt with the scraps I'd make a mini for baby naps! Scraps for a scrappy quilt? Yes please!!! What a nice idea - thanks for the chance to win! Lovely quilt! Thanks for the chance! Beautiful quilt. I be the scraps are just as fun! Is it weird to want someone else's scraps?? I hope not!! Very cute line!! Oh I love this line! I have been looking for the map and mermaid prints for my daughters quilt! Such a cool pattern too. These colors are so pretty and sweet!! Scraps? Oh yes! You can never have too many! HELLO,Yes Please,these are so beautiful!One cannot waste a scrap the price of fabric today! Thank You! Always happy to take scraps off someone's hands! I think your quilt is so pretty. I would love to use some of your scraps in my charity quilts. 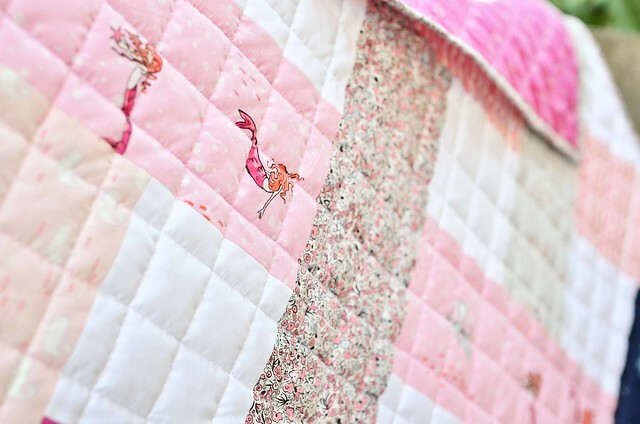 Lovely quilt, I love the little pink mermaids! Love how many quilts you get completed. Amazing. Nice fabrics. love a chance for your scraps ! your work is beautiful ! What a stash buster — just give the scraps away!!! I love this collection! Thank you for the opportunity to win. Other people's scraps are so enticing. Thanks for sharing. I love scraps! I like to paper piece quilts and scraps come in handy. Thank you for sharing! Awesome quilt, love the fabrics. Beautiful quilt, the fabrics are perfect. There is something magical about opening a package of another quilter's scraps. Thanks for offering to share. I love your quilt - and would love to win your scraps - thanks. Beautiful quilt and your scraps would be welcome . I would love your scraps! Fun, fun! I'm concentrating on scrap quilts right now and I would love to win your scraps of this wonderful fabric. Scraps in this very pretty palette would be welcome anytime. The prints are adorable...ooh the mermaids. Really nice baby quilt. this is one of my favourite lines, it looks so good in the Betty quilt! This is a great quilt! I love the large scale of your basket weave! I also love Sarah Jane and this line, eapecially! Crossing fingers and toes that I might get lucky! I love scraps and I love this collection! I would love to add your scraps to mine to make this quilt. I love this line-so I would love the scraps!!! I love all of Sarah Jane's fabrics - I'd like to make a small quilt with your scraps! I love the quilt and would be so happy to win your scraps , thanks for the chance. I love the colors and this quilt is just adorbs. I want to make this!!! Your quilt is gorgeous!! I would love your scraps... Although I would call them treasures because this collection is awesome!!! Please deposit them in my scrap bucket! I'd love to use these scraps in a quilt formy new granddaughter. I consider myself a scrappy quilter! Perfect fabric for something for my little granddaughter. Thanks for the opportunity to win! I agree with you about that binding. Pink and black, yummy!! That is so generous of you to offer this scrap opportunity. Thank you! I really enjoyed viewing all of your quilts on your updated Quilt tab! I'd love to win those "out to sea" scraps. Love to make scrap quilts and most of what I have done is scrappy. What a beautiful collection! I think it would match perfectly with some Heather Ross fabric. And I love (LOVE!) your quilt. Thanks for the chance to win! Yes please - love those mermaids! Yes, I would love your scraps!! This is so beautiful! Thanks for the opportunity! Just found your blog, and I would love to have your scraps! Thanks for your offer. Lovely quilt! Love this pattern, I recently purchased from you. And I can always use more scraps! Beautiful quilt! I would love some scraps-one can never have too much fabric, right? Love this quilt! 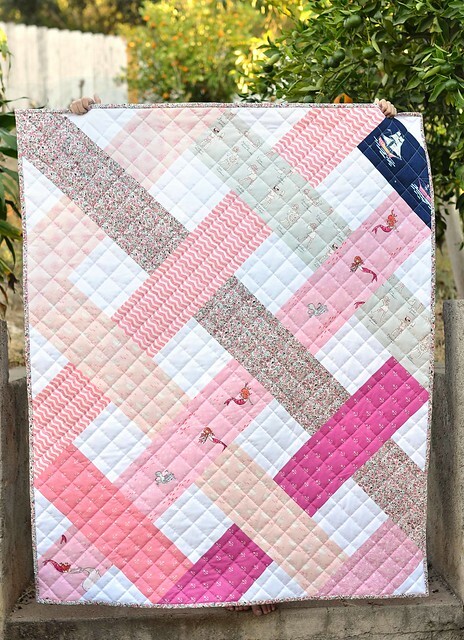 I make charity quilts for a kids' chemo unit and would love to have your scraps to make a pretty pink girl's quilt. Gorgeous quilt, beautiful fabric - thanks for the chance to win some scraps! I am a self professed scrapaholic. I love Out to Sea and would love to be the lucky winner! Thanks for the chance to win! Those mermaids are lovely and make your quilt extra special. It's so nice of you to share your scraps, and beautiful ones they are too! Your quilt is beautiful, and I am sure that the quilt from scraps will be too. Thanks for the opportunity - for whoever wins them! I make a lot of scrap quilts, always looking for different scraps to use. Thank you for the drawing.